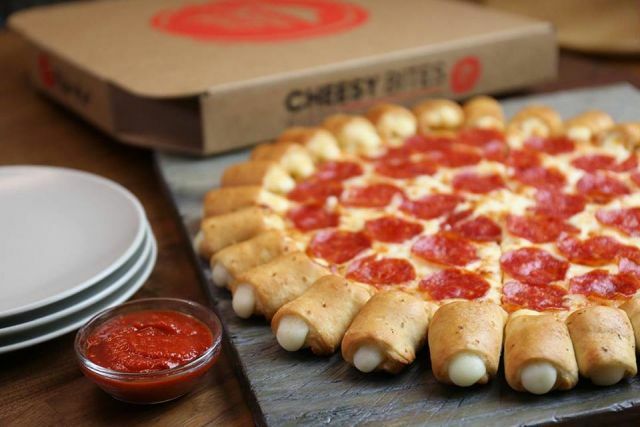 The Cheesy Bites Pizza returns to Pizza Hut for a limited time and, this time around, is featured in a promotional tie-in with the upcoming Spider-Man: Homecoming movie. The pizza's key feature is a ring of 28 bite-sized, mozzarella-cheese-filled bread rolls around the crust. You can get a 1-topping, large Cheesy Bites Pizza for $12.99 (may vary). The pizza will be available through July 9, 2017. As for the Spider-Man tie-in, the pizza comes in a box illustrated with a Spider-Man design, while supplies last. You can find my previous review of the Cheesy Bites Pizza here.